Every once in awhile I get a craving for fried chicken. And the sad thing is, until yesterday, I’ve been unable to make it and there’s a dearth of good fried chicken here (I have still yet to try Roscoe’s Chicken and Waffles). I’ve tried a number of recipes (including Cook’s Illustrated among others) and none of them satisfied (usually the batter didn’t come out correctly). I mean, fried chicken has a look. Everyone knows what fried chicken looks like. And mine never did. It was either too pale or too dark. Or it had mostly fallen off the chicken. And it didn’t have a satisfactory taste to it. But that all changed last night. 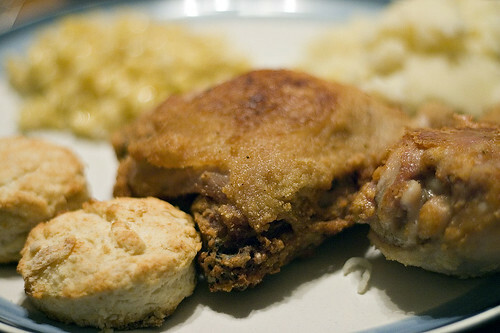 I finally had fried chicken success. I was finally a fried chicken master. The chicken was browned. It had the look. It was juicy all the way through (is it me or is one of the most disappointing things in the world dry fried chicken breasts?) Okay, it came out overly salty (I’m blaming that on my over optimistic reading of the line “brine for at least 4 hours or overnight”; when they say overnight, the Lee Brother’s apparently don’t mean 24 hours). But it was still good. Very good. 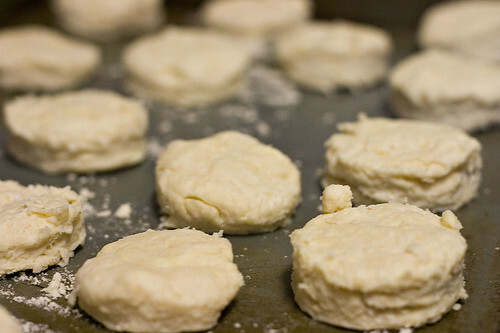 And it was even better with their biscuits and creamed corn. In a medium bowl (one that holds about 2 to 3 quarts; mine is actually my “small” bowl), stir together the brine ingredients until the salt is dissolved. Trim any excess fat from the chicken thighs and legs (on mine, there was a large layer of fat on the underside of the chicken thighs) and then add them to the brine. Cover the bowl and place in the refrigerator. Brine for 4 hours and up to overnight (which is what the recipe said; I brined over night and the chicken was too salty; in this case, overnight should mean no more than 8 hours or so). 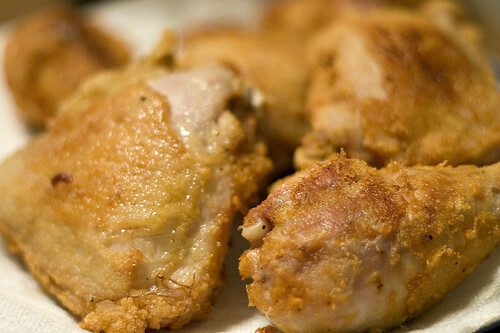 Remove the chicken from the refrigerator at least two hours before cooking so that it can come up to room temperature. In shallow dish mix the dredging mixture together (I actually have a set of plastic dishes that are designed for breading food). Dredge each piece of chicken through the dredging mixture, until coated thoroughly. Shake off any excess. In a large skillet (preferably cast iron and you need it to hold all the chicken), add enough oil to coat the bottom by 1/3″. Heat the oil over high heat until it reaches 325ºF. Add the chicken skin side up, cover the pan, and cook for 6 minutes. Turn the chicken, cover the pan, and cook for another 6 minutes. During the cooking process attempt to maintain the heat between 325ºF and 350ºF. Remove the chicken to a paper towel covered plate. Serves 2 to 3 (we had leftovers which are my lunch today).